Point of interest, that I haven't stumbled upon lurking around here yet and the search is useless for: why do so many of you call the Red Sport cars RS 400? As far as I can tell there is only one RS trim, one S trim, etc. My best guess is it has something to do with the 400HP, but we don't call the Q50S an S 300. It seems completely superfluous...? Most/some people think it's a "regular" Q50, but many of them on the street get "educated"
Same thing would occasionally happen with my Golf R. Confused for GTI by some. That R's awd dsg turbo flies. Not so much with the 5.0L ISF bc it looks & sounds very different from the "regular" models. I wonder why Infiniti designated a red "S" on rear deck lid and fender instead of "Q50 RS" & "RS 3.0T". "Q50S" can be mistaken for 3.7 L Sport models from rear to casual observers. Just saw this "S color" designations on a car review video ^^. Still learning about the Q. Last edited by Q50 RS400! ; 04-11-2019 at 02:07 PM. I suppose, and I figured it was something like that. Then again, if the point is to abbreviate something needlessly long and redundant, I circle back around to Q50RS literally tells you exactly what car it is with or without the 400. It would make more sense if there were RS350's or RS300's, but there aren't. If you're going to add three unnecessary characters to it, AWD or RWD offers 100% more distinction than 400 does. I'm really quivling over trivialities though, and feel like I'm just trolling at this point. The question has certainly been answered, thanks. New to the forum. 2015 Q50 Premium with Nav 3.7 rear wheel drive Malbec Black sitting on 19 inch Niche rims staggered. Will eventually drop it about an inch or so all the way around. Dude is that in Horsham? A new player has entered the game. 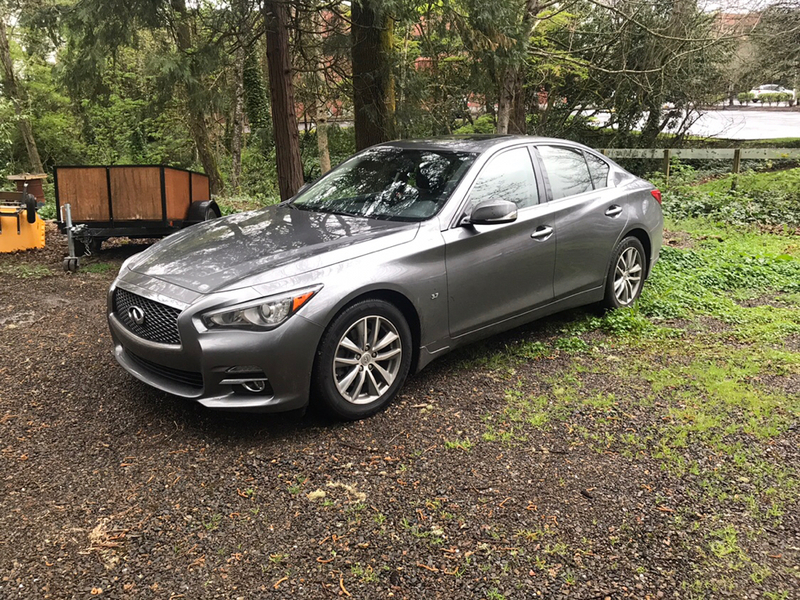 2015 Q50 Premium. Fantastic color!!! Lol. Nice pic fyi. Just a suggestion..go to "user CP" there you can update your location. It helps forum members make informed decisions about your car or questions you ask. Also you can add a signature, nice to put your car info in there too. Last edited by JohnInNH; 04-13-2019 at 01:23 PM. Thanks. First car bought off Vroom.com. Worked out pretty well. Picked up a set of 20x10.5 GTR 10-spokes last week. They are definitely aggressive for this car. I am looking into getting a few mm taken out of the offset to pull the wheels in more. "It's a Daily, do not tempt me!" Nah just slam that thing down they’ll tuck nize! Seriously though you may be better off running some additional negative camber rather than trying to go the machine route. How much clearance do you see on the front calipers? BigHeadClan and Bullitt like this.